The early history of the family of MULHOLLAND is obscure. In 1803 Thomas Mulholland senior, described as a "dealer", bought two houses in Upper Church Lane, Belfast, signing the contract with a simple cross (X). About 1815, the family entered the flourishing cotton industry by purchasing a mill. Thomas died in 1820, but the business continued to expand. In 1822, his sons built a huge spinning mill in the Point Field near York Street. One Sunday morning in June, 1828, however, disaster struck when this mill was almost totally destroyed by fire. Yet in fact time was to prove this a most fortuitous disaster for the Mulhollands. The brothers, Thomas, Andrew and St Clair, with the support of their partner John Hind, decided to rebuild the mill, but for the spinning of flax not of cotton. In addition to their business interests, the Mulhollands also took an active part in civic affairs. St Clair was a JP for County Down and High Sheriff of County Louth and in 1865 he donated money for the erection of a new wing at what was to become the Royal Victoria Hospital. His elder brother, Andrew, had married Elizabeth McDonnell in 1818 and had one son and four daughters. He served the office of Mayor of Belfast in 1845. He built Ballywalter Park, to which he moved in 1846; and he is perhaps best remembered in Belfast today for having provided the Ulster Hall with its fine Grand Organ in 1862. Andrew Mulholland bought the Ballywalter estate from the Matthews family in 1846 for the sum of £23,000 (£2 million in 2010). Andrew's eldest and only son John (1819-95) was educated at the Royal Academy in Belfast and eventually assumed control of the family interests, which aside from the mills included a substantial amount of land: 13,500 acres in County Down and over 1,000 acres near Cookstown in County Tyrone. John was noted for his business and financial acumen which carried him well beyond the linen industry. He was, for instance, involved in 1860 in advising HM Government during negotiations with the French over an important commercial treaty regulating trade between the two countries – and, among various other provisions, lowering French duties on flax and linen. He also played a prominent part in organising the finances of the Church of Ireland after it was disestablished in 1869. He was a JP and High Sheriff for both Counties Down and Tyrone. In 1868 he stood as a Conservative candidate, with Sir Charles Lanyon, the architect of Ballywalter, for the constituency of Belfast. Both, however, were defeated, with John coming bottom of the poll. Yet John persevered and in 1874 he was returned unopposed for Downpatrick, a seat he retained until 1885 [and where his influence, as ground landlord of most of the town, was very strong]. Although he held no political office, he spoke frequently on Irish questions and was a strong supporter of Tory policies. In 1892 he was raised to the peerage, being created Baron Dunleath, of Ballywalter, on the recommendation of the outgoing Conservative Prime Minister, Lord Salisbury. Aside from linen and politics, the 1st Baron's other great interest was sailing. His yacht, the 77-foot schooner Egeria, built in 1865, dominated racing in her class for many years, winning in all over 60 major prizes. Lord Dunleath died in England in 1895 and was buried at Ballywalter. The 1st Baron became one of the wealthiest men in the Kingdom, leaving an equivalent fortune of £57 million (£583,000 in 1895). 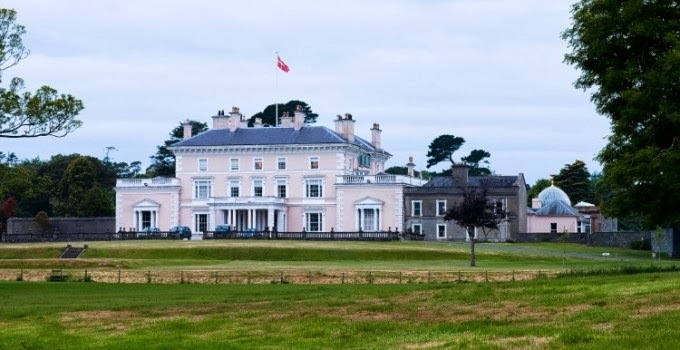 BALLYWALTER PARK, located in the middle of the Ards Peninsula in County Down, is one of the finest private demesnes in Northern Ireland. Dunleath Estates Limited has been controlled by Lord Dunleath, chairman; Lady Dunleath; Lord O'Neill; J McK Harris; and R P Blakiston-Houston. The Estate today extends to 1,500 acres though, 150 years ago, it comprised 13,506 acres (including the Downpatrick Estate). Mulholland purchased the Downpatrick Estate from the Ker family (of Montalto, Ballynahinch) in 1874, with the exception of the Ballynahinch lands. Although Ballywalter Park had a different and earlier provenance (the Matthews family), the vast majority of the Ards estate derived from the Blackwood family, whose seat was Clandeboye, near Bangor in County Down. The then head of that family, the 1st Earl of Dufferin (later 1st Marquess of Dufferin and Ava), lived much beyond his means in the period up to the late 1860s and became heavily mortgaged to John Mulholland (1st Baron) whose acquisition of the Dufferin estate in the barony of Ards, to the north of Ballywalter, was a matter of foreclosure rather than purchase. In the short term, this was an undignified and even false position for Dufferin to be in, because he was a leading Ulster Liberal and prominent on that side in Belfast politics, whereas Mulholland was a leading Belfast Conservative. In the longer term, however, the arrangement benefited both families, because it contributed to establishing the 1st Baron as a major County Down landowner and it forced Lord Dufferin to concentrate on what became one of the most important late 19th-century British diplomatic and proconsular careers. By 1876 he owned 6,769 acres in the county with a yearly rental of £10,668 (almost £1 million in 2010). He held another 1,244 acres worth £1,530 annually in County Tyrone, where he was also appointed sheriff in 1873. Mulholland obtained Dufferin's Ards estate during the sales. It was adjacent to his county seat, Ballywalter Park, the ownership of which obviously obviated any social need for him to buy Clandeboye House and its demesne, which Dufferin was, with a heavy heart, prepared to sell. Ballywalter Park, his existing estates, the newly acquired Dufferin acres and his large fortune and public philanthropy, all secured Mulholland's position as an established gentleman. This social success was rewarded in 1892 when he was created 1st Baron Dunleath. When he died in 1895 his estate was valued at £583,266 gross, about £57 million in 2010. The original Ballywalter estate consisted of a demesne of around 250 acres, with a two- storey over basement Georgian House called Springvale. Andrew found the existing Georgian house too modest for his ambitions, since he had also become Mayor of Belfast at the time of his purchase, and so he commissioned the architect and fellow Belfast city councillor, Charles Lanyon, to build something more in keeping with his perceived status. Ballywalter House is stated to be Ulster's finest 19th century palazzo, with a metropolitan air and all the architectural trappings of a London club. The Dunleath Papers are held at the Public Record Office of Northern Ireland. The present demesne is an amalgamation of two adjoining older establishments, viz. Ballymagown, later Springvale House (the site on which the present house is constructed); and Ballyatwood, to the west. The first house of Ballymagown, a two-storied block over a basement, was built in the 1730s by Mr Matthews following its purchase from the Montgomerys' Rosemount estate. It was remodelled between 1805-12 and renamed Springvale. Planting and features remain from this earlier phase. Following the purchase of the demesne by the 1st Baron in 1846, work began on the present house by Lanyon, which was completed in 1852. This involved remodelling and extending the existing Springvale house, subsequently renamed Ballywalter Park, in Italian Renaissance style. In 1863, Lanyon returned to add the conservatory and the Gentleman's Wing to the north-west corner; while in 1902 the architect, W J Fennell, added the Bachelor's Wing to provide accommodation for visiting cricketers. 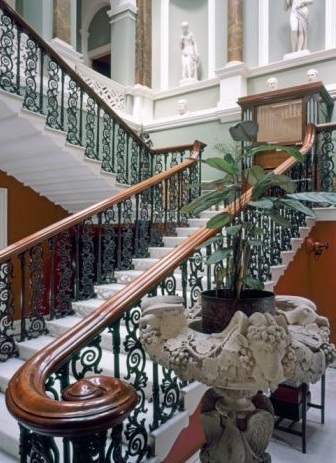 A balustraded entrance drive at the east front of the house overlooks parkland to the sea. Extensive replanting followed the purchase of the property in 1846. Older shelter belts were retained as an important element in an exposed site, while others were planted for the present house. There are mature woodlands, with rides and extensive parkland within the walls. Planting post-1846 was extensive and about 93,500 trees and shrubs were added in the first winter. Mature parkland trees at the west side of the house were removed to give space for planting fashionable exotic evergreens. Rhododendrons were introduced. The latter collection flourished in the first half of the 20th century and the surviving plants are recorded in Mary Forrest’s, Trees and Shrubs Cultivated in Ireland, compiled in 1988, including several raised by the 3rd Baron Dunleath and, notably, Lady Dunleath. There is a rock and water garden (restored in 1988) dwarfed beneath the now large evergreens amidst rolling lawns. The garden front of the house overlooks wide-spreading lawns with paths and statues, beyond which is a notable collection of ornamental trees and shrubs. One vista has been cut to a modern folly of 1986. Many paths have been grassed over. A dovecote of 1759 lies in the woods. Ornamental bridges by Lanyon span streams. The walled garden, contemporary with the present house, is cultivated and adorned with a rose pergola. A rose garden occupies the southern end of the garden and there is ornamental planting on the exterior, on the path from the house to the walled garden. Glasshouses have recently been restored. The head gardener, W King, contributed a regular column to Irish Garden on ‘The Flower Garden’ in the hey-day of Northern Ireland’s great country house gardens just before the 1st World War. An Edwardian cricket pitch and 9-hole golf course are no longer present. The retained Springvale pre-1834 stables are listed. There were originally seven gate lodges, one of which is by Lanyon ca 1850 and another by Fennell of ca 1900. I would like to find out the names of the children of the 1st Baron Dunleath. Many thanks.